Eduard Buchner demonstrated that fermentation can be brought about using lifeless chemicals rather than living yeast. He established that biochemical reactions are possible outside living cells. His discovery led to him receiving the 1907 Nobel Prize in Chemistry. Eduard Alois Buchner was born on May 20, 1860 in Munich, Germany into a prosperous family. His father was Ernst Buchner, a physician and professor of forensic medicine at Munich’s Ludwig Maximilian University. His mother was Frederike Martin, the daughter of a treasurer to the royal court. Eduard’s elder brother Hans, 10 years older than Eduard, became a renowned bacteriologist. Eduard also had a half-sister, Amalie, from his father’s previous marriage which had ended with the death of his first wife. Amalie became a teacher. When Eduard was 12 years old, his father died after suffering a stroke. This was shortly after Eduard enrolled at high school – the Maximilian Gymnasium. Aged 18, Eduard Buchner completed a spell in the Army in 1878, and also began working very hard to become scientifically knowledgeable. He studied and worked in a number of fields simultaneously. In 1884, Buchner began postgraduate chemistry work directed by the future Nobel Prize winner Adolf von Baeyer. In 1885, he published his first paper on fermentation: The influence of oxygen on fermentations. Buchner was awarded a Ph.D. by the University of Munich in 1888. In 1891, his thesis on synthesis of pyrazole, pyrazoline and trimethylene derivatives and a lecture on The Chemical Processes in Fermentation allowed him to qualify as a lecturer. In fact, Buchner was the first person to synthesize pyrazole. In 1893, Buchner became a lecturer at the University of Kiel. In 1896, aged 36, Buchner became Extraordinary Professor for Analytical and Pharmaceutical Chemistry at the University of Tübingen. There he began the work on alcoholic fermentation without yeast cells that led to his Nobel Prize in 1907. In 1898, he was appointed to the chair of chemistry at the Agricultural College of Berlin. He also directed the Institute for fermentation, continuing his cell-free fermentation studies. Buchner demonstrated that chemicals extracted from dead yeast, containing no living cells, could convert sugar to alcohol. The fermentation process did not require life. Instead it required the activity of chemicals called enzymes. This was a very important discovery because it established that biochemical reactions are possible outside living cells. 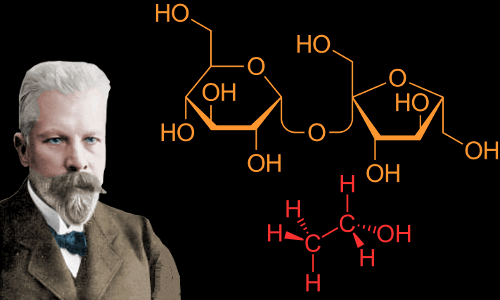 Buchner gave the name zymase to the enzyme used by yeast to convert sugar to alcohol. In August 1900, age 40, Buchner married Lotte Stahl, the 24-year-old daughter of a Tübingen professor. The couple had four children: Friedel, Hans, Rudolf, and Luise. Luise died in infancy. World War 1 began in 1914, and by 1915 Buchner, aged 55, had become a Major in a transport unit. In 1916, he was exempted from military duties and resumed his academic studies. When America entered the war in 1917, Buchner volunteered again to serve in the German army. On August 11, 1917, he was badly wounded while serving in Focsani, Romania. Eduard Buchner died, aged 57, on August 13, 1917 in Focsani, Romania from wounds received in military service and was buried at Focsani’s military cemetery. He was survived by his wife and three children. Images of Buchner digitally enhanced and colorized by this website. "Eduard Buchner." Famous Scientists. famousscientists.org. 15 Apr. 2017. Web.